Mutations in the d-myo-inositol 3-phosphate synthase 1 gene (MIPS1) in soybean [Glycine max (L.) Merr.] cause modifications to seed phosphorus and carbohydrate content that improve the nutritional value of food and feed. 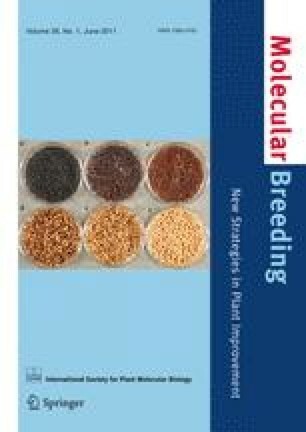 Molecular markers are an efficient tool for breeding MIPS1 mutant germplasm due to reduced seed germination and field emergence potential. An F2 population segregating for the MIPS1 mutation found in experimental soybean line V99-5089 was used to develop breeder-friendly markers. Markers were validated in 88 advanced lines from 9 diverse pedigrees. Ten potential simple sequence repeat (SSR) markers, located on Gm11, from the new BARCSOYSSR_1.0 database were tested and four were polymorphic. BARCSOY_11_1495 was 93–97% effective for selecting the mutation. A KBiosciences Competitive Allele Specific PCR (KASPar) assay was developed to select directly for the V99-5089-derived MIPS1 single nucleotide polymorphism (SNP) mutation. The KASPar assay is simple and cost-effective compared to other SNP genotyping assays. The MIPS1 mutation in V99-5089 is likely to have occurred spontaneously. We describe a method of DNA extraction in soybean using a Geno/Grinder for fast and easy tissue maceration. We thank the United Soybean Board for funding projects 8234, “Development of low phytate soybeans using genomic tools” and 8227, “The use of genomics to improve soybean meal digestibility and food quality”, that supported this research.